A bespoke build we now boast a 7m high medieval flame beacon with ceramic logs which has a remote ignition system. Another bespoke ForceFX Creation is our 7m high flaming beacon. Initially designed & used for a week long burn for the re-burial of King Richard III. 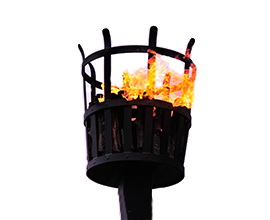 The beacon is a propane based flame system with a remote ignition to ensure the flame can be used in adverse weather conditions, if the flame goes out it can be easily relit. The top of the Beacon is filled with realistic ceramic logs & has an optional bracket to afix a logo or design on the front.